An analysis of 50 years of rainfall data in arid regions by researchers at Cardiff University and the University of Bristol in the UK has shown a decline in rainfall intensity, despite an increase in total rainfall. The findings run counter to research that suggests that global warming causes heavier rainfall, because a hotter atmosphere can hold more moisture, and warmer oceans evaporate faster, thus feeding the atmosphere with more moisture. Until this study, the link between climate warming and heavy rainfall has only been examined in regions where moisture availability is relatively high. No research has been undertaken to examine the relationship between climate change and rainfall in dryland regions where short, sharp rainstorms are the dominant source of precipitation and where moisture availability on land is extremely limited. 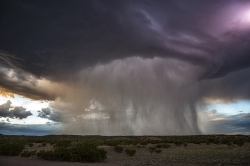 To explore the links, scientists analysed more than 50 years of detailed rainfall data, measured every minute, from a semi-arid drainage basin in south-east Arizona exhibiting an upward trend in temperatures during that period. The analysis demonstrated a decline in rainfall intensity, despite an increase in total rainfall over the years. The study shows that there is a long-term decline in heavy rainfall events, greater than 25mm/h, and an associated increase in the number of smaller storms each delivering less rainfall.